Going on a safari is on most travellers and wildlife fans bucket list. After a month-long housesit in Maun, Botswana, we decided to treat ourselves to a 6-day safari in the Okavango Delta. Why go on Safari in Botswana? Although it is located in the midst of the Kalahari Desert, the Okavango River floods the Okavango Delta annually leaving behind floodplains, smaller rivers as well as more sandy savannahs. This means that each campsite offers a different environment. 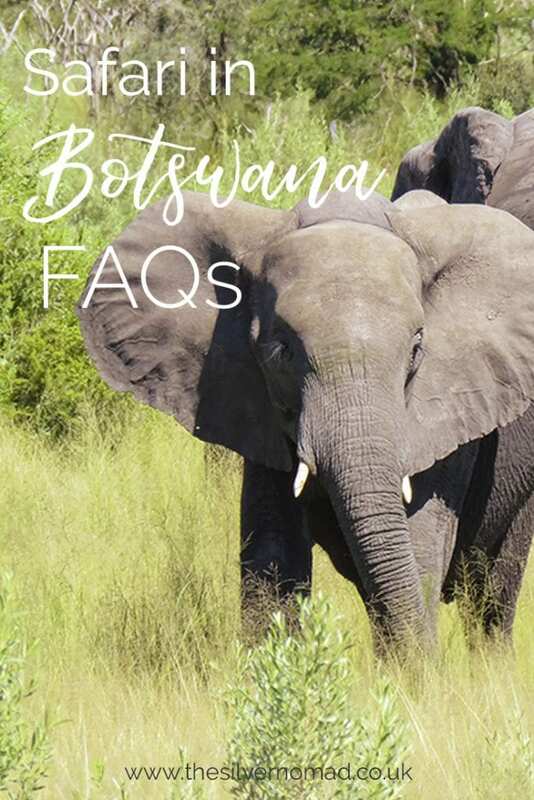 The majority of the national parks and wildlife reserves in Botswana are not fenced in which allows the animals to roam wild and are free to migrate through the country. 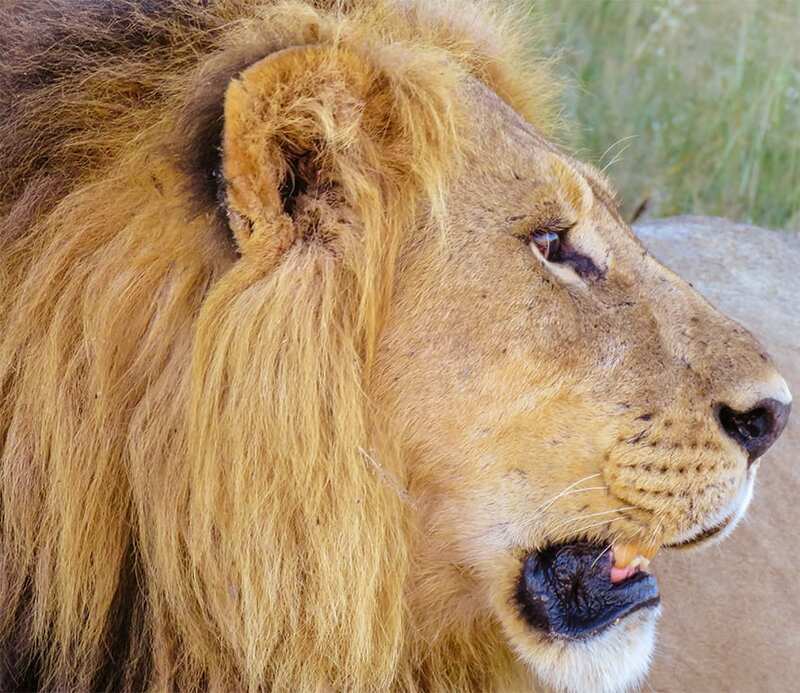 Maybe you want to see the Big Five – lions, leopards, rhino, elephants and buffalo – or the Ugly Five – hyenas, warthogs, vultures, wildebeest and the Marabou Stork. You can see all of those in Botswana, though rhinos are notoriously difficult to see. Our housesit host, Glen, owns the travel agency Liquid Giraffe and they arranged our itinerary for us with three different camps and a variety of potential wildlife to see. How do I get to Botswana? Most safaris for the Okavango Delta start from Maun, though you don’t have to leave from Maun, and can open-jaw your trip (ie. fly into one airport and leave from another). Depending on where you are flying from, flights tend to be via Johannesburg. You can either opt to stay in Maun for a few days or go straight to your camp. I always check out flights on Skyscanner to find the best deals and routes. For Okavango, Moremi and Chobe safaris, the best time to visit Botswana for a safari is from June to September. For some of the drier areas, March to May is better. High season is July to October where prices go up, and it is busier. Low season is December to April and some of the camps and lodges actually close down. The months to avoid are October and November when it is very hot and January and February which are at the height of the wet season. To check whether you need a visa from your country, have a look at your own government’s or the Botswanan Government website. Most Commonwealth and European countries as well as places such as the USA and Japan do not need a visa but do check as this can change. When you land in Botswana and go through Passport Control, you will be asked what the length of your stay is and this will be marked in your passport, it may be better to give yourself a couple of extra days leeway in case of problems. 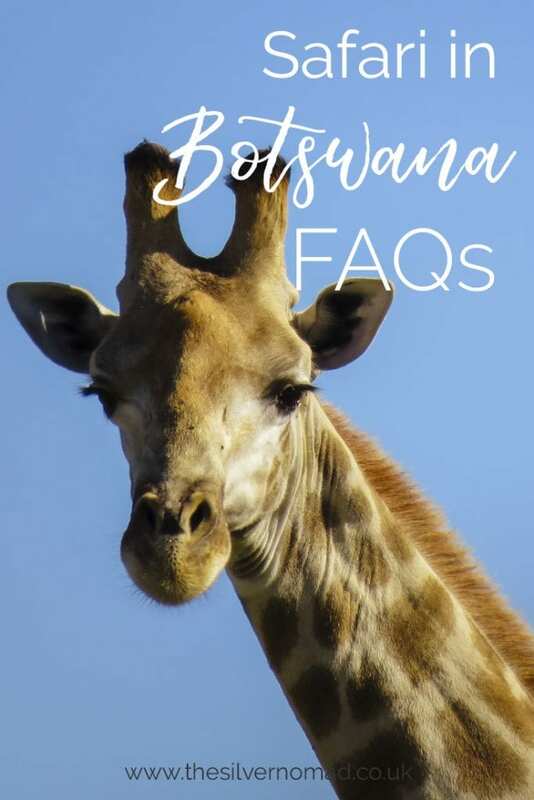 The Botswanan Pula is not one of the world’s major currencies, although it is one of the strongest in Africa, so you may not be able to get any outside the country. You can exchange most foreign currencies at the banks in Botswana or use the ATMs. If you are staying in Maun, there is a Barclays Bank branch with a foreign exchange desk and ATMs outside. You will see plenty of wildlife, but exactly what will you will see cannot be guaranteed. Animals don’t appear on demand and can be unpredictable. If you have a particular list of animals you want to see, let your guide know and they will do their best to fulfil your wishes. Maybe you want to see the Big Five – lions, leopards, rhino, elephants and buffalo – or the Ugly Five – hyenas, warthogs, vultures, wildebeest and the Marabou Stork, they can be elusive and unpredictable and you have to remember you are not at a zoo. Sometimes the animals you see are as much of a surprise to your guide as they are to you! Most animals are camouflaged to protect them from being eaten, but that means they may be hiding in plain sight from you too. Keep your eyes peeled and you will be amazed at what you can find. Safaris, in general, are very safe. If you listen to the guides and follow their advice, you will be fine. When you are in camp, don’t wander about at night, if you need to get out of your tent, put on your light and use the whistle provided to attract attention. A safari is not a fashion parade. The days start off at 6 am so it will be cold, but as you go through the day it will get very warm, then it will get cold again in the evening. Layers that you can take on and off are the best way to go. Comfortable cotton clothing in khaki or sand colours are good, try to avoid really bright colours. Also, it does get dusty, so don’t bring your best clothes unless you don’t mind them getting dirty. You can check ahead as some of the camps have a laundry service. I found that we didn’t get “dressed” for dinner. Most of us had a shower and put on a fresh shirt before we came down for drinks and dinner. Flat shoes, trainers or boots are fine to wear but leave your heels at home. The ground you are walking on will be dusty tracks, muddy or uneven. Flip-flops or sandals are fine around the camp. Take a hat or, like I did, a buff which can double as a protector for your neck, to keep your hair back or to cover your mouth if it gets too dusty. Don’t forget to bring suncream and sunglasses you don’t realise how strong it can get. Ladies, a quick tip, safaris can get bumpy and a good sports bra does help! It is important to remember that if you are travelling by small bush plane you will be limited to what luggage the hold will carry. Also, a soft case is easier to fit in the hold than a hard-shelled case. Do I really have to get up early? The safari day starts early. 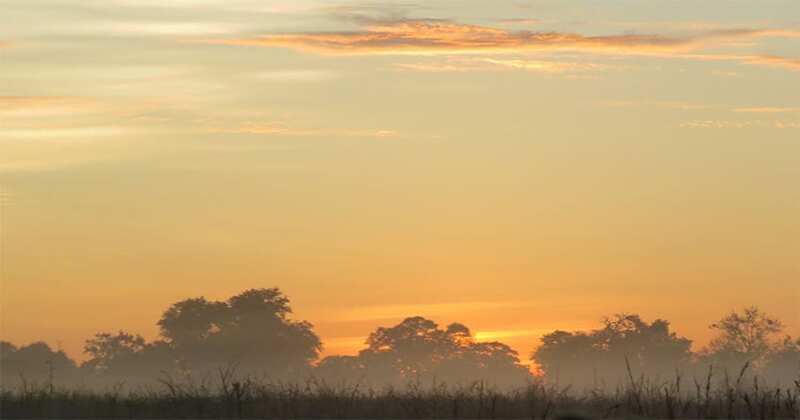 Your guide will come to your tent and give you a wake-up call around 5.30am After a coffee and a bite to eat, the early morning safaris start out just before dawn. The mists are still rising, animals are active, either returning from a night’s hunting, hiding from predators or just getting ready for the day. It is also cooler and the light is gentler than in full sun and you are in what they call the “golden hour”. It really is the perfect time to go out. Ah, the thorny subject of money. There is a safari to suit all budgets. You can go for all-in safari packages which include all your transport, meals, drinks (alcoholic and non-alcoholic) and the guides. These will be at fixed lodges or campsites and you will either fly in a bush plane or be driven between camps. A less expensive option is a mobile camp. They are a bit more basic and if you don’t mind roughing it, this may be an option for you. Instead of permanent lodges or campsites, the tents are moved with you as go round the park. There may not be running water and the toilets may not be what you are used to. It is best to establish your budget and then work with a travel agent to find the best options. Liquid Giraffe who arranged our safari, came up with a great itinerary for us covering 3 different campsites and different terrains. Will I get a phone and Internet signal? 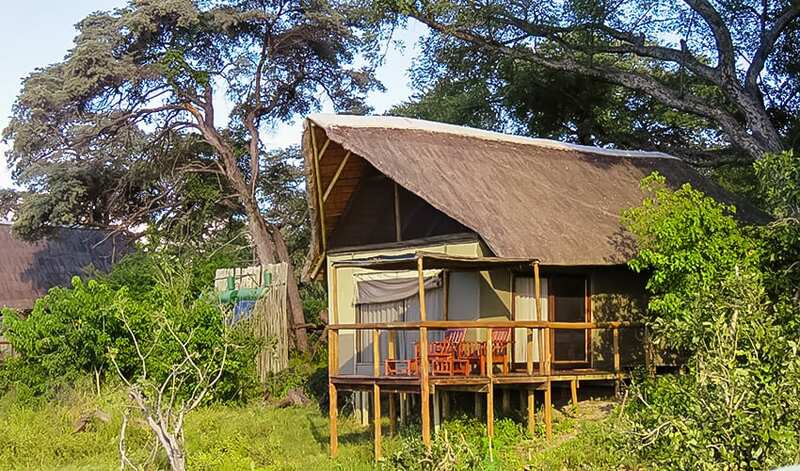 Most safari lodges and camps do not have mobile or Internet coverage. We live in a world where many of us, myself included, want to post, tweet, Instagram or log our every move on social media, but look on this as a time where you can digitally detox, immerse yourself in the surroundings and relax. The campsites themselves are in contact with the outside world, and we gave our travel agents’ contact details to family and other important people, in case of emergencies. Our dog, Izzy, was going in for an op on our first day, and we received word that all was well, so we know it works! How many guests are there at a camp? Each campsite is different but most are small and intimate, with maybe 8-10 tents, so potential up to 16-20 guests. The most we had at a camp was 10 but that was only for one night. One day we had the whole camp to ourselves, which was lovely, but also slightly sad. Meals are served together so you have an opportunity to get to know the diverse range of people who go on safaris. Over the 6 days, we met a banker, a diplomat, a private chef, an interior designer, retired people, an accountant, a GP, a ski instructor, a bank manager and a midwife. There was a group from France, Australians, Irish, Germans, Americans, Swiss, a charming Indian and other Brits. No two days were the same. Be open to it and you will enjoy it. How many people do you have to share a vehicle with? Normally it is a maximum of 6 people plus a guide, who is driving and spotter, who is… well, spotting! Depending on how busy the camp is, you may have a vehicle just for yourself. Can I take my kids? A safari can be a great experience for older children, but under 10s do get bored with the long game drives. Sometimes they cannot curb their enthusiasm and can call out frightening the animals, or try to get out of the vehicle to get closer. Younger children are also more prone to sunburn and feeling ill. Many of the camps have an age restriction and will not accept under 12s, but ask a specialist to find out more. Some camps have a family tent so that children can sleep near their parents, generally is a separate room within the main tent. You will also tend to have your own vehicle so that the children can enjoy the experience without disturbing any of the other guests. Aren’t you just staying in big tents at the campsites? Well technically yes, but these are not just any old tents, these are luxury tents. Big enough for beds that you are so large you need a walkie-talkie to talk to each other. A seating area, both inside and out. Beautiful views. Baths, the freestanding bath in Kwando Lagoon looked out onto the Linyanti River, divine! Outdoor showers, there is nothing better than showering in the open air. They are most definitely not the dank, poky tents that I remember from childhood. I am a vegetarian/vegan/have food intolerances will they cater for me? I am a vegetarian and I found that I had no problems with any of the food on offer. My travel agent had already alerted the camps, but I also had a quick chat with the camp managers. There was normally a salad and a specific dish for vegetarians as well as vegetable side dishes. Let’s just say, I didn’t go hungry! The meals on offer were delicious and freshly prepared. Tipping, how much and to whom? Tipping is, of course, up to you. The guidelines we were given were the equivalent 10 US Dollars to your guide and 5 for your spotter per day. You can also leave a tip for the rest of the staff to share, maybe 10 US Dollars per day to be split between them. The tips are given at the end of the safari and can be in US dollars or Botswanan Pula. Either take some the envelopes with you, use the ones supplied in your room or just hand the cash over discretely. I have mobility issues, can I still go on safari? This really depends on the nature of your disability. Many of the safaris are over rough rutted tracks and you do get bounced around a lot during the day. The Land Cruisers we were in were high off the ground, so you had to climb up. If you have problems with mobility that might be an issue. Getting around camp might also cause problems. Some have walkways, steps and the ground can be uneven. There are specialist tour companies who deal with safaris for people in wheelchairs and have specialised vehicles to accommodate them. Have a chat with Liquid Giraffe who will be able to advise you on the best safaris to go on. 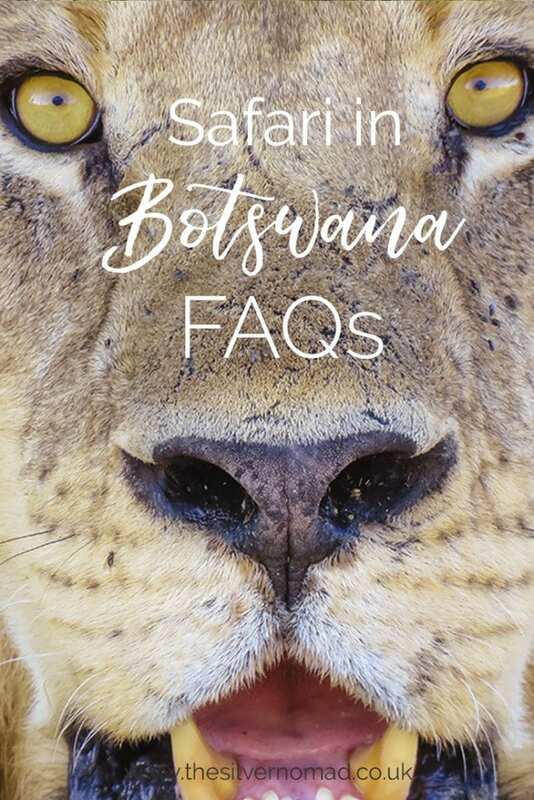 I hope these FAQs have answered some of your questions and helped you decide to have an amazing safari in Botswana. Fantastic write up with lots of useful and valuable tips. Great article Larch! Thank you Glen, and thank you to you and your staff for arranging it all. We had such a great time!